I never had any desire or intention to read The Perks of Being a Wallflower by Stephen Chbosky but my professor had other intentions. I figured that I probably couldn’t read it so I listened to the audio book, read by Noah Galvin. Mr. Galvin deserves an Oscar or some kind an award because he really rocked it. I can’t stop gushing about how awesome a job he did. Charlie is nervous about starting high school. So he begins to write letters to the only person that would listen to him. Through the letters we see how Charlie is attempting to navigate his way through uncharted territory that is freshman year. Charlie is loveable from the first sentence out of his mouth. For me Galvin’s voice really made the story come alive. While the story has its ups and downs, there isn’t a very intense plot, yet the reader is somehow sucked into Charlie’s head sharing his first kiss, his feelings toward his new friends, his feelings towards literature and music. He is naïve about so many things, and his bluntness made me laugh out loud on numerous occasions. I am stunned how much it made me laugh. (I’m pretty sure people thought I was crazy as I was walking through the park and listening to the book.) 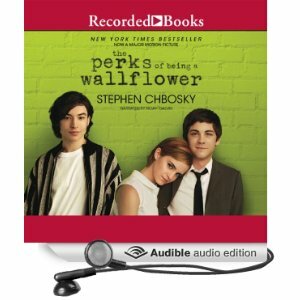 Chbosky does an excellent job of balancing fun and funny moments with incredibly sad and shocking ones. A must read. This entry was posted in Young Adult and tagged Noah Galvin, Stephen Chbosky, The Perks of Being a Wallflower, Young Adult. Bookmark the permalink.